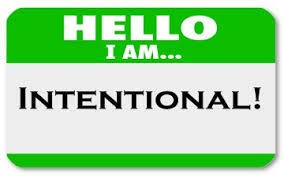 The word “intentional” has been heavy on my mind for a few days now. I’ve reached a point in my life where doing something just to do it has lost its appeal. When I was younger I would make exceptions for things. It was the whole, “why not, I don’t have anything better to do” syndrome. What I’ve realized is that kind of mindset allows too much room for ambivalence, complacency, and distractions to wreck havoc. No one likes the idea of being “ON” all the time. But the one’s that are see their dreams come to pass far quicker and far more frequently than those that want to “chill” all the time. Life is to be lived but what good is living if it’s not within your purpose… if you’re just roaming the earth attracted to every shiny new toy that comes within sight. When does the excitement of new “things” that are not in line with what you were put on earth to achieve lose their zeal? I’ll tell you. When you’re exhausted from the rat race of keeping up with everyone else’s rat race. When you finally ask God why you’re still breathing? When you realize that time is the absolute most precious thing we have. Not one person with an incurable, terminal illness is sitting around wishing they had more clothes, more women, more cars, more stuff. I guarantee that each one of them wishes for more time. Even when we lose family members, we as survivors wish for more time with them. It’s my 2015 goal to make better use of my time. Even my chill time has to be directed. I’m spending quality time with special people creating memories. I’m appointment viewing my favorite TV shows and as of right now there are only two and half (Jury is still out on Empire, lol). I’m not surfing channels looking for shows to take up my time, I’m not going out just to go out, and I’m not reading things that don’t inspire and help me create a better life for myself. I’m working on passion so that I can get out of the prison of having to work for a vision that is outside of my own. I’m putting my hand to plow to help overcome the social and humane injustices that have plagued a community that I represent far beyond the color of my skin. The heart I have for animals and their welfare will soon be shared on a bigger platform. I’m volunteering and using my gifts to enhance other people’s visions that I support because I believe what you make happen for others, God will make happen for you. I’m writing, applying, and learning more about my craft everyday. 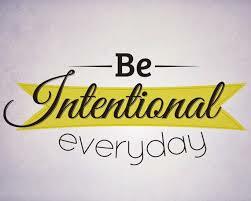 Yes, I am intentional about mine. It’s about being intentional with your time, who you spend your time with, and what you spend your time doing. Don’t be thrown off by the time it takes to get to where you want to be. Relax. Take it one day at a time and remain focused. And let me say this: stop getting sucked into the “Lifestyles of the InstaFamous.” Please understand that people only post what they want you to know. You’ll never know the real person through social media so stop measuring your life against theirs. Stop thinking you have so far to go when you have no idea what life beyond the selfie is like for them! Social media is a lot of fun but it can get dangerous when you think of how much it influences people’s thoughts and actions. I could go on for days about this but I’m getting off topic. Let me just encourage you to take inventory of how you’re spending your time this year. Every hour doesn’t have to be planned but you should have a goal for each day and everything in those 10-12 hours should be working towards accomplishing it! It’s time out for watching everyone else’s dreams unfold. Let’s make 2015 a year to remember for what we are able to achieve… in real life! Amen!! I’m right there with you sis! The “surfing shows” portion of this is so deep, it may actually go over folks heads!!! lol. Some people have too much idle time on their hands, while their purpose becomes gone with the wind. We truly gotta #staywoke and live ON PURPOSE… intentionally!!! Far too much to do…far to little time. Not busy just to be busy stuff, but true make a difference stuff. Acting on visions…not acting b/c of what somebody else LOOKS like they’re doing. LOVE THIS BLOG YO!!!!!!!!!!!!!!!!!! Thank you sis!! Appreciate you! Yes!!! This is so good and so right on time! This falls right in line with what God has been speaking to me lately! When you live with intention, it makes it a lot easier to say yes and no to certain things/give your time and attention to certain things, and that is freeing! What a great filtering system 😉 and loved those verses! Thanks for this reminder sis! Reblogged this on R.H.S. Ministries. It would be a dream to collaborate on this project! I’ve been following @stephanieike since hearing her speak @tphonela. Can’t wait to witness the impact! THIS is #goals! @theshaderoom @thesameroom Repost @stephanieike with @get_repost ・・・ 📣#Repost @theshaderoom #Roommates, #TheShadeRoom is proud to announce our very first production, a new digital talk show & podcast series, @TheSameRoom, hosted by @StephanieIke, the campus pastor at The Potter’s House, Los Angeles. This is set to premier Tuesday, April 30th. The show offers an authentic and insightful take on unconventional faith-based topics, with a unique blend of guests. The Same Room is spearheaded by our very own Founder, Angelica Nwandu, who is the series executive producer. Fatima Elswify; whose production credits include OWN’s Super Soul Sunday and Stephanie Ike serve as producers. ____________________ On each episode, Stephanie will have unfiltered conversations addressing the truth and misconceptions of faith in today’s culture alongside guests such as; @adriennebailon, @cthagod, @msamberpriley, @drcarolineleaf, @dr.matthewstevenson, @nowthatsmajor to name a few. “The Same Room is paving new grounds for how faith is engaged in—read more at TheShadeRoom.com!